"A very simple recipe if you don't like using or buying a lot of ingredients. Serve over egg noodles." 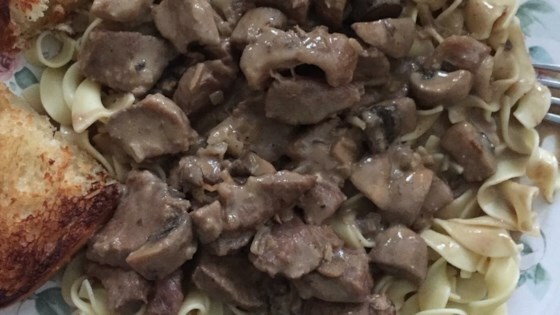 Whisk cream of mushroom soup, water, and dry onion soup mix in a slow cooker; stir meat into soup mixture. Cover and cook on High for 1 hour. Reduce setting to Low and cook until beef is tender, 2 to 3 more hours. Test for doneness after 2 hours. Stir cream cheese into beef until smooth. Gravy was good but I have never had good luck with stew beef. Too chewy. Better to use ground beef. Good luck. good recipe! i substituted hamberger for the tips and added mushrooms, but very good and went over well. minimal prep time too. My husband and I had this tonight, and we both loved it. It was very filling; and it was the perfect meal for a chilly winter night in New England. Quick, simple and delicious. I loved this considering I used ground beef and I did not have sour cream on hand so I was hoping it would still taste good and good enough it turned out yummy!! !